OK, so you’re hurting. You need a doctor. But which kind? Well, it depends. You may have stomach problems, or heart problems. You may just want a little superficial nip-and-tuck to make you feel younger. Or it may be really serious, and a trip to the Emergency Room is in order. But perhaps, all that’s wrong is an emotional thing, and maybe a therapist is the right one for you. In any case, you want to be paging Dr. Barnes… well, at least one of them anyway. Any of the five will do. Because they all should provide the best medicine on television: laughter. 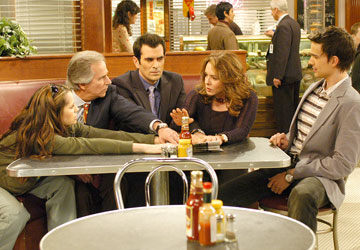 Out of Practice premiered on CBS in the fall of 2005. It was about the Barnes family, each of whom had gone into the healing arts… and each of whom were comically broken in some way. Our lead is youngest son Ben (Christopher Gorham), a marriage counselor who fixes relationships, and might be just the thing this busted family needs (if they’d ever give him some respect, instead of treating him as “less” of a doctor because he has a psych degree instead of a biological one). His parents are divorced, but still tend to their grown children despite their antipathy for each other. Mother Lydia (Stockard Channing) is a heart specialist with little “heart” of her own, worried more about social-climbing and being a miracle worker than she is about the individuals whose hearts she repairs. Father Stewart (Henry Winkler) is a gastroenterologist who can’t stomach dealing with the confrontations forced by his family, yet loves them anyway (well, most of them… he and Lydia are still at odds, on principle if for no other reason). Eldest son Oliver (Ty Burrell) is just as superficial and vain as the women he specializes in “perfecting” with his plastic surgery skills, and would just as soon chase after any of them as work on them; and daughter Regina (Paula Marshall) might beat him in the skirt-chasing, as she’s a lesbian and thrill-seeker who works in the E.R. at the same hospital with her parents. Together, there’s a prescription for laughter here that could, with half a chance and a little work, turn out pretty well. Which means, of course, that it didn’t last all that long. It wasn’t for lack of trying, though. The show had an excellent pedigree, with Channing, Winkler, and Marshall being experienced comedy hands in both movies and television. Gorham and Burrell had great futures waiting after their experience on Out of Practice, showing they also knew what they were doing. The show was co-created by producer Christopher Lloyd, known on TV for being the comedy mind behind successful series Frasier and Wings. So, there were definitely people around this show who knew how to land a joke or two. But those jokes were what needed the doctoring on Out of Practice. While the actors gave their roles some depth (more than was originally written, really), the actual laugh lines weren’t necessarily fall-down funny. And that’s being generous. If you look at modern comedies, and the scripts they use, there had better be a joke on at least every half page (and more near the finish) or the show plays comparatively slowly. If the jokes aren’t at least good, if not great, the entire thing grinds to an unfortunate halt. And in Out of Practice, you had five characters who should have had plenty in comedic ammunition, but actually didn’t. Different styles and practices of medicine may as well be different planets as far as mining laughter, and I would hesitate to hear funny emergency room comments from a plastic surgeon, or marital advice from a gastroenterologist. Family and professional conflict can create decent drama, and sometimes decent comedy too, but in the case of Out of Practice (at least early on), all it did was kind of grind. On Out of Practice, it was supposed to be the family creating “the tie that binds”… but it didn’t. Lydia and Stewart were divorced, a fact which was played up consistently as repeated squabbling (despite the fact that these two people apparently loved each other enough to raise three grown children). Stewart was trying to have a relationship with his receptionist Crystal (Jennifer Tilly), even though she was the same age as his kids. Oliver, the plastic surgeon, went through women quickly in both his dating and professional life (and when you have a character who’s supposed to be shallow, you’re not getting much to dig into). Daughter Regina wasn’t relating to the family that much either, as she was looking for excitement, both at the ER and in her relationships (and never finding enough). And that left our central character of Ben who, in the pilot, has his marriage end when his wife leaves him. While his family tries to rally around to help, we see that it’s really the family that needs him. But the way the show is presented, the other characters don’t realize this, even if we do. They’re the broken ones, really, although they think they’re whole. They’re the individuals who need the tender loving care and help of a doctor the most, and it’s a situation where the idea of “physician, heal thyself” is the one thing these doctors just can’t do. So, not just the characters, but Out of Practice itself might be in need of medical help. What to do? The concept of a “script doctor” has been around a long time. These writers’ sole job is, not to plot out stories, but to “punch up” a script, to make it better. Some are like general doctors, polishing entire scripts, creating (hopefully) more sparkling dialogue or better transitions and situations. Others are surgeons, adding humorous lines here and there. In the specific case of a situation comedy, these “script doctors” are on staff simply to make already plotted stories as funny as possible. Out of Practice needed a script doctor… stat. Most modern sitcoms shoot an episode a week, but the finished script for that episode isn’t really “done” until the evening of the shoot… and sometimes, filming is even stopped because a new joke is found on the spot. Writers go through multiple sets of changes, all in search of better jokes, funnier bits, words and situations that will leap off the page. Many times, ideas are formed during the rehearsal process, with writers seeing actors on stage and getting a better idea of how things “play” instead of “read”. Scenes, and sometimes entire scripts, are rewritten to take advantage of these possibilities, and this is where a comedic “script doctor” earns his or her money. Because they have to be both quick and funny, every time. These kinds of “script doctors” are rare and valuable people, the ones who can literally be funny on demand, and they get paid a hefty sum to do so… but they’d better produce, or else. Like a real doctor, they have a show to save, and humor is the medicine used. And if the patient (show) dies on the table, then lots of people are out of jobs. "Hello? Give me something funny here!" Sometimes, a mid-episode rewrite (or multiple rewrites) aren’t enough. Significant changes have to be made, and shows are taken off the air while producers, writers, and cast all try to hash out possible ways to become funnier, better, more watchable. This happened in the spring of 2006 with Out of Practice. But sometimes, despite the best efforts of all, the patient is just not able to be saved. CBS tried to work with the show. It ran from September 2005 until March of 2006, when it was replaced (for what was supposed to be only a short time) by The New Adventures of Old Christine, starring Seinfeld veteran Julia Louis-Dreyfus. Old Christine garnered a significant ratings bump compared to Out of Practice, which had been replaced temporarily to try to “fix” some of the perceived problems it had attracting viewers. After the numbers came in, CBS simply decided to go with the new show rather than try to heal the previous one. The network pulled the plug, and Out of Practice never returned, leaving eight episodes unaired in its network run. CHRISTOPHER GORHAM (Ben Barnes) has starred in numerous series, including Popular, Odyssey 5, Jake 2.0, and Harper’s Island. He played boyfriend Henry to Ugly Betty, and is currently seen on the USA series Covert Affairs. An incurable romantic, he proposed to his college sweetheart after a picnic outside Tiffany’s on Rodeo Drive, just before going in to pick out rings. STOCKARD CHANNING (Lydia Barnes) is a veteran of stage and screen, known to a generation as Rizzo in the movie version of Grease. She played First Lady Abigail Bartlett on The West Wing, as well as starring in two short-lived self-titled situation comedies (The Stockard Channing Show and Stockard Channing in Just Friends). She’s appeared on Broadway numerous times, in the musicals Pal Joey and They’re Playing Our Song, and dramas The Lion in Winter and Six Degrees of Separation. HENRY WINKLER (Stewart Barnes) essayed television icon Arthur Fonzarelli, better known as Fonzie, on the classic sitcom Happy Days. He also did a turn as a lawyer in the cult TV hit Arrested Development. He branched out into television producing, as one of the creative minds behind the long-running MacGyver. Diagnosed with dyslexia, he’s co-written children’s books featuring the character Hank Zipzer (also dyslexic), a 4th grader characterized as “the world’s greatest underachiever”. 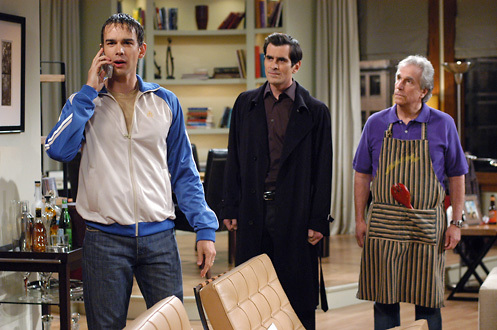 TY BURRELL (Oliver Barnes) was a regular on Back to You, also created by Christopher Lloyd. His major claim to fame is on the current smash Modern Family, where he’s garnered Emmy nominations each of the past two years for Best Supporting Actor in a Comedy. PAULA MARSHALL (Regina Barnes) has been featured on this site previously for her work in the original Cupid (1998). A TV veteran whose closest thing to a hit was the two-season Gary Unmarried, she nonetheless has been a regular actress in half a dozen series and a recurring character in many more. She may get the chance to try again this fall in a new Fox comedy called Little in Common. JENNIFER TILLY (Crystal) is a multi-talented star, with an Oscar nomination (for Bullets Over Broadway) and stage credits (The Women, a Broadway show that was taped and later shown on PBS). She’s lent her voice to numerous projects, including Pixar’s Monsters, Inc. (and its upcoming sequel, Monsters University), the Chucky horror series, and TV’s animated Family Guy. She’s an accomplished poker player, having earned a silver bracelet for winning an open event at the World Series of Poker, beating out 600 players there. … but it was just too late. Audiences just really didn’t tune into Out of Practice. The show lost a pretty good size of the audience from its lead-in series, although it did finish second in its time slot (only behind ABC’s farewell season of Monday Night Football). Perhaps the reason it didn’t continue really was the “doctor” process after all. When Out of Practice took a break to “heal”, The New Adventures of Old Christine gained a million viewers more than Out of Practice had produced in the time slot. CBS simply went with a show that apparently was more popular… leaving another to fade away. But things like that happen all the time in television. Shows are saved through heroic measures (ask any Chuck fan about Subway sandwiches and you’ll see what I mean). Shows also die for the most absurd reasons (be it petulant actors or just whims of the powers-that-be). It’s kind of like life, in that you really can’t predict with any certainty whether a show will die quickly or run forever… but with the right doctor in your corner, the odds get a little bit better. Aired at Friday 8/7 Central? Mondays at 9:30/8:30, between Two and a Half Men and CSI: Miami. Both of these shows were in the top 20 that year, Out of Practice didn’t make the top 30.